And how do they know when they have arrived–at a small speck on the planet where none has ever been before? We are participating in a Symbolic Migration. 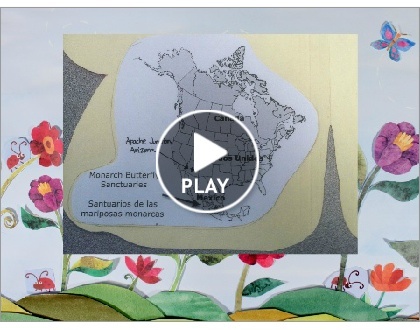 When the Monarchs arrive at their destination in Mexico in November, local schoolchildren are excited to see them and protect them in their winter sanctuary. We sent a batch of paper butterflies that we made to the children in Mexico to thank them for their work. In the spring we’ll receive our own package of butterflies from somewhere in North America. We’re excited to see how far our butterflies will travel! Here’s a map showing the packages which were sent so far in the Symbolic Migration—click on Arizona to see ours! Here is a Smilebox showing us creating our package of butterflies to send to Mexico. Do any of your local animals migrate when the seasons change?